The Fiat 1300 coupé "Sportinia of 1962 designed by Giovanni Michelotti and built by Scioneri. Scioneri was founded in 1943 by Antonio Scioneri at Savigliano near Cuneo, they were first interested only in repairing damaged cars (apart from the household appliance side of the business). With the postwar car market booming they gradually began 'personalising' the cars produced by the major manufacturers, starting with two-tone paintwork and such like. In 1950 they produced their first body and went on to become well known, especially for a four door Fiat 600 of which they built about 15000. Their spiders and coupés were based on the Fiat 600 and Fiat 1100 proved very popular during the 1950s and in 1960 they moved to a new factory in another part of Savigliano. Other cars which emerged included a Fiat 1500 based coupé and a few Alfa Romeo variants whilst later most of the mainstream Fiats were used in some form or another. This type of car would characterize of Scioneri production in the years to come with models derived from the Fiat series, in particular the Fiat "1100/1200" (1958), "1300/1500" (1961), "600 D" (1963), "850" (1964), "124" and "125" (1966 - 1968). Also, reworking occurred even for some companies like Lancia ("Appia") and Alfa Romeo ("Juliet") in 1959, and the "850" spiders of 1964. 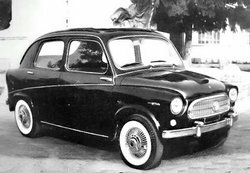 At the 1963 Turin Motorshow Scioneri presented a prototype using Fiat 600D mechanicals. They also produced a less modified two-tone version. 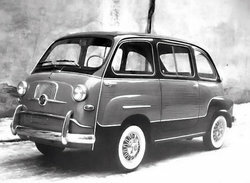 At the 1964 Turin Motorshow Scioneri displayed two models using the Fiat 600 as a base. One was a coupé, the other a spider. At the Turin Motorshow of 1962 Scioneri displayed this four-seat coupé using Fiat mechanicals. From 1966 Scioneri built a 2+2 coupé using Fiat 124 mechanicals. Scioneri Fiat 125 coupé Fiat 125 based cars. In 1967 Scioneri presented this 2+2 coupé using Fiat 125 mechanicals.